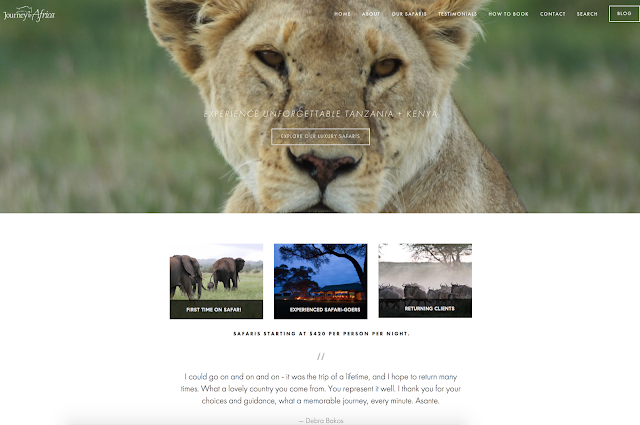 For the last three months I've had the pleasure of calling Mefi Alapat of Journey to Africa a Mad Meg client. From our very first meeting, we became obsessed with each other (or was that just me?) and she's been a joy to work with ever since. Our first order of business was to, ta-da, build her a brand new website and now we're working on some PR initiatives. 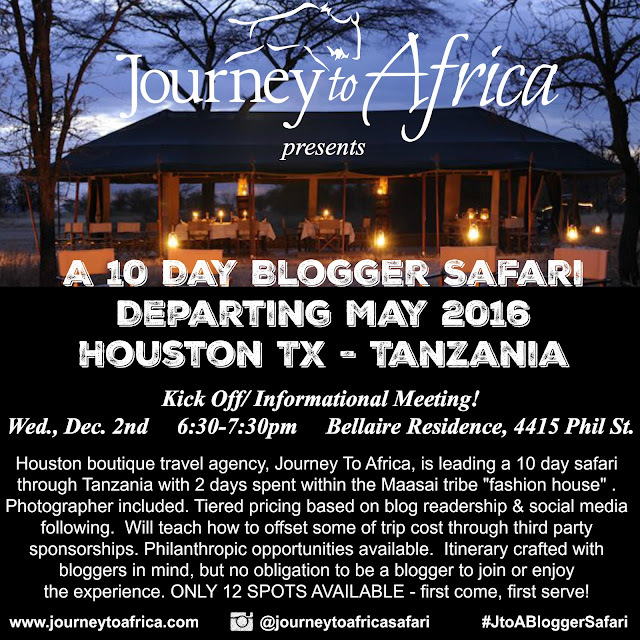 So without further ado, it is my pleasure to announce a 10 Day Blogger Safari departing end of May - beginning of June 2016. "WTF is a blogger safari?" you ask. While all of Mefi's safari packages are custom created by her, a native Tanzanian, (is it bad that I'm not a newly wed but still want to go on the honeymoon safari? And I got to take Mace on the family safari. ) the blogger safari was planned with bloggers in mind. This means we'll have a full-time photographer joining us so bloggers can truly live in the moment and not worry about documenting the trip yet still come home with great shots. It means that we're offering tiered pricing for the trip. So the more readership and social media following your blog has, the less it will cost you. It means that we'll be spending time at the Maasi tribe "fashion house" learning how these women are being empowered through their amazing jewelry designs. Lastly, it means we're offering help and guidance to any blogger interested in offsetting some of the cost of the trip through third party sponsorships. Not a blogger but still want to go? That's cool. Are you a blogger that doesn't live in Houston but still wants to go? That's cool too. You don't have to be a blogger nor reside in Houston to enjoy the trip. We're simply taking the first 12 girls who sign up. Mefi's trips are led by her and her friends and she finds that the more intimate the group, the better experience she can offer. One of the places we'll be staying at. NBD. So what do you do if you're interested and want to learn more about the blogger safari? You can check out the itinerary here but you'll definitely want to attend the informational meeting Wednesday, December 2nd from 6:30-7:30pm. Mefi will present the trip over Tanzanian tea and treats and answer any questions that you will surely have. RSVP to her by emailing her at mefi(at)journeytoafrica(dot)com.